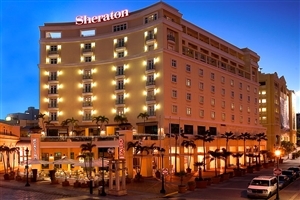 Enjoy some of the most iconic landmarks found across San Juan’s most culturally enriched districts while staying in a haven of comfort at the Sheraton Old San Juan Hotel. 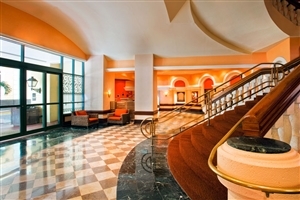 Situated directly upon the waterfront of Old San Juan, the hotel is a great place to start and end each day for those seeking to get the most out of their Puerto Rican holiday, boasting close proximity to plenty of historical hotspots as well as shopping outlets, elegant eateries and nightlife venues that are sure to appeal to avid adventurers. 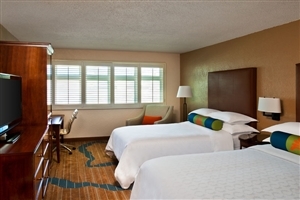 The hotel itself houses a number of modern facilities, an in-house restaurant, plush-filled accommodations and an exceptional level of service so staying in and relaxing is always a great alternative. Whether for exploration or relaxation, this Caribbean getaway is just the thing for a fun-filled experience. Settled deep within the Old San Juan District of Puerto Rico’s bustling capital city, the Sheraton Old San Juan Hotel boasts an enviable waterfront position, showcasing some of the most memorable views in the area while also providing easy access to many of the city’s most prominent highlights and culturally significant landmarks. With an array of modern facilities on hand, an in-house eatery to visit and plenty of accommodation types to choose from, the hotel is a great place to start and end each day in complete comfort, while the popular shopping outlets, tourist highlights and nightlife venues are all nearby just waiting to be discovered on what is sure to be a most memorable occasion. The Traditional Room offers guests a stylish accommodation intricately designed with modern comforts and plush furnishings throughout that come together to ensure traveller satisfaction. The Deluxe Room offers guests a contemporary accommodation lavishly fitted with plenty of comfortable conveniences along with elegant furnishings to entice even the most discerning of visitors. 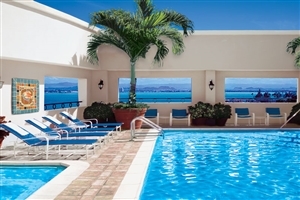 The room features more space and boasts of views overlooking the Old San Juan waterfront. The Suite offers guests a generously spacious accommodation beautifully designed with modern overtones that combine with a distinct Caribbean style to create a haven of comfort and convenience. The suite features more space and boasts of views overlooking the Old San Juan waterfront. The Presidential Suite offers guests a palatial accommodation that sets the tone for a truly memorable occasion with its lavish furnishings, elegant sense of style and boastful levels of comfort. The suite features a living area and a private balcony that looks out over the Old San Juan waterfront. Palio – Revel in the fine flavours of Puerto Rican fusion cuisine at this elegant eatery while gazing out at views of the Old San Juan harbour.